Outrage over coyote-killing contests in Wisconsin is producing a move to outlaw them. This isn't hunting and is just a sick way of playing with guns. Honest hunting groups should be behind this ban. This type of "fun filled" slaughter reflects badly on legitimate hunters and contributes to anti hunting sentiments. This bill ,in its current form, is poorly conceived, vaguely deceptive and based on predominantly false information or misinformation. It should not be allowed a hearing or vote in its current version. How is a organized rabbit and squirrel hunt inhumane, when it strictly says that all hunting/ DNR regulations for hunting methids, hunting hours and bag limits apply? How is the fact that many clubs and rural establishments have contests for the biggest turkey or deer registered, during normal hunting seasons. How is that so appalling? Harley sales fall. Big win for Trump. 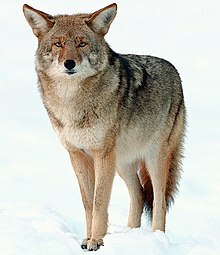 Do we really need coyote killing contests in WI? Was there a dupe, and did he dupe a dope?